What happens when we are not generous? We will be taken in by Greed, Stinginess, Selfishness and being Miserly, the opposites of God’s call. These rotten fruits are rotten because we hoard things and money and do not use them properly as Christ called us to do. This blocks the flow of God’s blessings and ‘living water’ from flowing in us and then to others around us. We will become stagnant and useless to the Kingdom or the people around us. How do I know if I am not a person who is generous? Do you see what you have as yours or you as a steward of what God owns? Do pride and arrogance have you? If so, this will be your driving force, the quintessential things that God hates the most (Proverbs 6:16-18)! One of the things I both love and hate to do is go out to lunch with a bunch of Christians. I love the fellowship, but when it comes to tip time, I, as the pastor usually ends up paying the tip and sometimes a lion share of the bill too. Then I hear complaints from waitresses about how stingy the various church groups are! This should not happen. When will we learn, as a Church, that our actions enable us to point others to the way to the Lord, and give us the ability to repel others from Him. Generosity is the realization we have His living water (John 4; 7:38) flowing in us. To keep it fresh, it must flow out of us, too! The Dead Sea in Israel is dead. Why? There is no life in it because it has no outlet. It has a river flowing into it, but the water remains there, and becomes stagnated with harsh salts and minerals to the point that nothing can live or grow there. When we are stingy, we become like the Dead Sea–stagnant and lifeless. The living water within us will quickly become stagnant, like a mud puddle with mosquito larvae growing in it, useless, and even dangerous. As ‘living’ water, it must be moving to be alive. 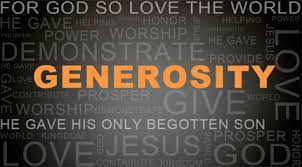 Generosity is an example of our trust and reliance on God. Because He has given so much to us, way beyond what we can comprehend, we can therefore be charitable to others. This is an act of worship–to model Christ, and see the big picture that goods and material things are not important, but relationships are. This goes to giving back to God, providing to those who have less, and making sure your church is modeling this character. Keep in mind that a selfish church that does not give, and only sees themselves as a charity, will become a Dead Sea rather quickly. How sad and pathetic that would be–an unconcerned, uncaring, and self-absorbed quandary to the neighborhood, and a disgrace to the Kingdom! Amen! If only we would get out of the way, so God could make us like this.